HUNTINGTON BEACH, California/ USA (Sunday, August 6, 2017) – Sage Erickson (USA) and Kanoa Igarashi (USA) claimed victory today at the Vans US Open of Surfing in two-to-four foot (0.5 – 1 metre) waves on the southside of the Huntington Beach Pier. A capacity crowd witnessed Erickson clinch the win at Stop No. 6 of 10 on the World Surf League (WSL) Championship Tour (CT) and Igarashi take out the Men’s Qualifying Series (QS) 10,000 event. Erickson claimed her first Championship Tour victory today after defeating 2016 event winner Tatiana Weston-Webb (HAW) in an intense Final. The 26-year-old will now vault from 9th to 6th on the Jeep Leaderboard, just 1,450 points behind World No. 5 Johanne Defay (FRA). The 10,000-point gain significantly strengthens the Californian’s 2017 World Title campaign heading into the Swatch Women’s Pro, Stop No. 7 on the Women’s CT. In their fifth head-to-head match-up, today’s Final saw Erickson claim her second win over Weston-Webb to earn the event title. Weston-Webb held an early lead through to the halfway mark with multiple attempts in the beachbreak conditions. Erickson stayed patient, with only one wave ridden at the halfway mark, but maximized on a second opportunity to take the first position away from Weston-Webb. Determined for a second event win, Weston-Webb battled back to earn a 0.36-point lead with less than ten minutes to go. Under pressure, Erickson had the Huntington Beach crowd to their feet as she meet the 4.63 requirement with a 6.67 for the win. Caption: Sage Erickson’s (USA) stunning performance in the Final resulted in her career-first CT win at the Vans US Open of Surfing. Today’s runner-up result marks Weston-Webb’s second of 2017. The 26 year-old is heating up this season with back-to-back event Finals with her finish in Huntington and at the OK Fiji Women’s Pro. Weston-Webb will move up two spots to 8th on the Jeep Rankings, just one place higher than three-time WSL Champion Carissa Moore (HAW). En route to her maiden CT Finals appearance, Erickson took out 2017 World Title contenders Courtney Conlogue (USA), Sally Fitzgibbons (AUS) and Moore. The second Semifinal saw a close battle between the California natives. Conlogue got an early lead with a 5.23, but Erickson came charging back with a 7.50 for control. Conlogue regained first position with a 6.23, but again, Erickson fired back with another big score to put the pressure on Conlogue. Needing a 7.11, the Huntington Beach local fell just 1.87 points short and was eliminated from the event. Conlogue is off to a great start this year with two CT wins at Bells and Fiji. Conlogue’s third place result will move her up to 3rd place on the Jeep Leaderboard and one step closer to wearing the yellow Jeep Leader Jersey. Weston-Webb dispatched Coco Ho (HAW) in the first Semifinal match-up. Ho will exit Huntington Beach with a 3rd place finish, her first Semifinal berth and best result this season. Ho will jump from 12th to 11th on the Jeep Leaderboard. Alongside Erickson’s stunning CT victory, Igarashi saved his best performance for last and opened up with an incredible, near-perfect, 9.63 in the Final — the highest single-scoring wave of the men’s event. The local hero bashed three major backhand attacks and finished on the shorebreak in front of his hometown crowd to the eruption of applause. Igarashi then took that momentum into his next wave with two more critical backhand snaps that earned him a 5.60 and put an in-form Tomas Hermes (BRA) in a combination situation — something Hermes was unable to come back from after Igarashi closed the door in the dying minutes with a 7.60. The 19-year-old was beside himself as his friends and family rushed in the water to the crowd’s deafening applause for his first-ever Vans US Open of Surfing QS 10,000 win. 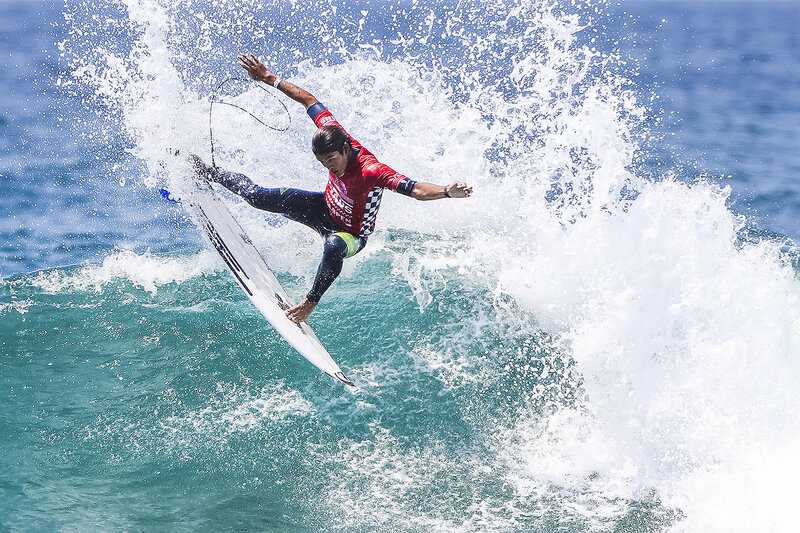 Caption: Kanoa Igarashi (USA) earned the Vans US Open of Surfing QS win in his hometown of Huntington Beach, California. Hermes’ incredible run at the Vans US Open of Surfing finished with 8,000 vital points and propelled him to QS No. 4 in hopes of CT qualification. Hermes now has a renewed vigor heading into the rest of the season after eliminating crowd favorites Patrick Gudauskas (USA) and Carlos Munoz (CRI) en route to his Final appearance. The result marks the 30-year-old Brazilian’s best finish since 2013, where he earned a victory in Portugal, but unfortunately the win was not to be replicated with the insatiable form of Igarashi. A rematch from last year’s critical Semifinal unfolded between Igarashi and Filipe Toledo (BRA) in dramatic fashion. The opening exchange witnessed both surfers paddle for a wave, but Toledo cut across Igarashi and was given a non-priority interference as the wave was deemed a disrupted opportunity for Igarashi, who was closest to the peak. The interference did not stop Toledo from putting on a brilliant aerial display that made Igarashi fight for every score through. Ultimately, hometown hero Igarashi emerged victorious after earning a 6.85, in need of a 6.50, and held that lead until the final horn. A year full of surprises continues at both the CT and QS levels with a big performance from Munoz, whose dream run ended in the Semifinals and catapults him into No. 19 on the QS heading into the back half of the year. The next stop on the 2017 WSL Championship Tour will be the Billabong Pro Tahiti, which will see the world’s best male surfers resume this season’s title race from August 11 – 22, 2017. Highlights from the Vans US Open of Surfing are available at WorldSurfLeague.com, the WSL app, and VansUSOpenofSurfing.com.